On Saturday morning I was sitting at my daughter's gymnastics class with my iPad so I could browse recipes to finalize my Father's Day Menu. I only had a small bowl of yogurt that morning, and my daughter claimed my Kind bar as her own before class, so I was starving. Looking at mouth-watering food pics while hungry is pure torture, especially when I was searching for some sort of bruschetta or crostini using Gruyere cheese. So many pictures of gooey melted cheese and crusty bread. Why was I doing this to myself?? 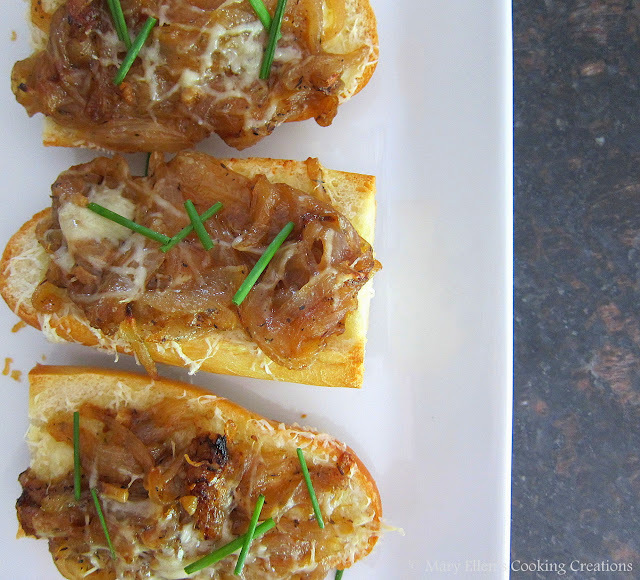 After pulling myself together and focusing, I decided on a recipe for French Onion Cheese Bread that I found on the web site foodiecrush. Upon reading it I figured that it would taste like French onion soup just without the broth, and I was right. 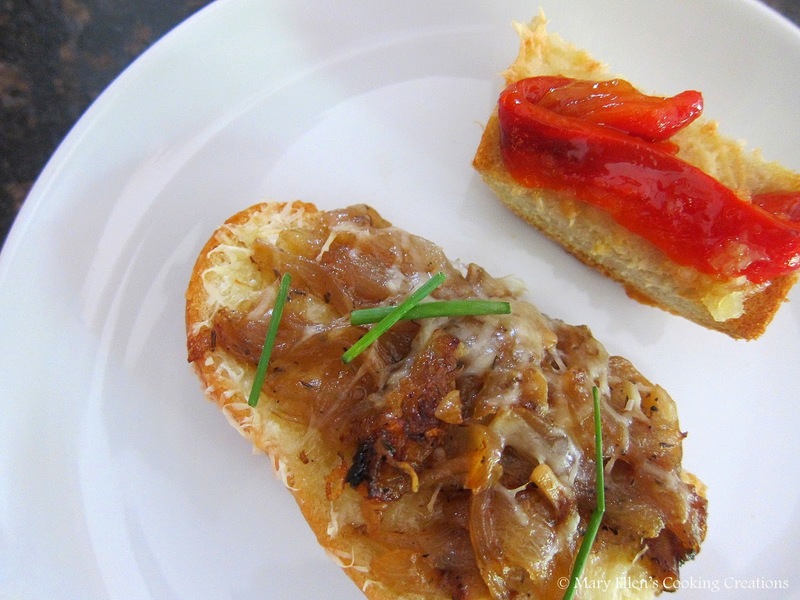 The French bread base is the crouton, and then there is a layer of creamy and nutty melted Gruyere cheese followed by some sweet caramelized onions. I served these as an app but can also see them being a great side. Caramelizing the onions takes a while, but once that is done (and you can do it ahead of time), these are quick and easy. Caramelize the onions: Melt butter in a large saucepan over medium heat. Add onions, garlic and thyme leaves and cook for 10 minutes, stirring occasionally. Lower heat to medium low, add the sugar, salt, and pepper; stir and cover and cook for 1 hour (mine took 35 minutes), stirring occasionally. Add balsamic vinegar and cook for another 10 minutes or until onions are caramelized, stirring occasionally. Place bread halves on a baking sheet, cut side up. Sprinkle evenly with shredded cheese then spoon caramelized onions on top. Bake for 10-15 minutes or until cheese has melted and bread turns golden brown.